Do you ship to Alaska, Hawaii & Canada? We ship all orders to the contiguous (48) US states by USPS Priority Mail or UPS ground. 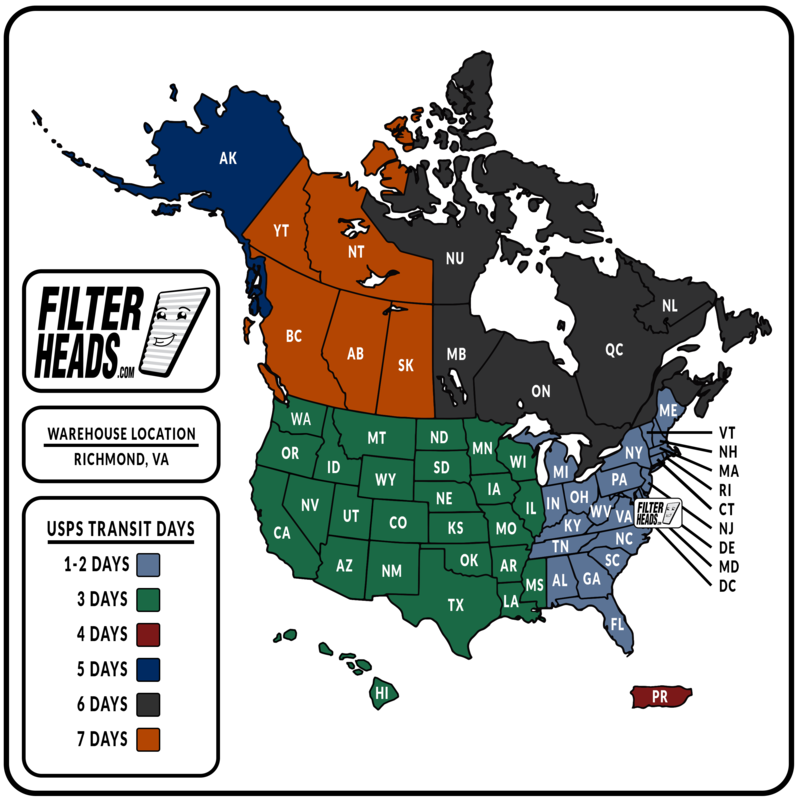 Orders to Hawaii, Alaska and Canadian provinces will be shipped by USPS. Orders will be shipped from our Richmond, VA warehouse. Orders that we receive before 3:00 PM (Eastern Time) will be shipped out the same day. Orders that we receive after 3:00 PM (Eastern Time) will be shipped out by the following business day. All orders shipping to Virginia will arrive in 1 to 2 days. All other state's orders will arrive in 3 to 4 days. Canadian orders will arrive in 5 or more days. Our days/hours of operation are Monday through Friday, 8:30 AM to 5:30PM (Eastern Time). If we do not have a part in stock, we do not show a "buy now" button for that part. If we determine that we cannot fulfill a customer's order after their payment card has been charged, we will immediately notify the customer by email and give them the option of a full refund or to keep their order open until we can fulfill it. Q: Do you ship to Alaska, Hawaii & Canada? Orders will be shipped from our Richmond, VA warehouse. Orders that we receive before 3:00 PM (Eastern Time) will be shipped out the same day. Orders that we receive after 3:00 PM (Eastern Time) will be shipped out by the following business day. All orders shipping to Virginia will arrive in 1 to 2 days. All other state's orders will arrive in 3 to 4 days. Canadian orders will arrive in 5 or more days. Our days/hours of operation are Monday through Friday, 8:30 AM to 5:00PM (Eastern Time). If we do not have a part in stock, we do not show a "buy now" button for that part. If we determine that we cannot fulfill a customer's order after their payment card has been charged, we will immediately notify the customer by email and give them the option of a full refund or to keep their order open until we can fulfill it. We want our customers to be completely happy with the product they receive from us. Our return policy is a 30 day, 100% money back guarantee. If the customer is not completely satisfied with the product, for any reason, we will refund the entire purchase amount (including shipping) when the product is sent back to us. So that we can connect the returned product to the original purchase, we require that customers obtain a return authorization number before sending product back to us. Call us at 1-855-598-8551 to obtain an authorization and instructions on where to send the product. We believe in the quality of our products, but we understand that there is always opportunity for improvement. We appreciate any feedback customers can give us about ways to improve.